Take Current Affairs quiz February 26, 2019 to enhance your General Awareness. Practice with our esteemed Current Affairs quiz February 26, 2019 questions which covers all important events across India as well as World. Make use of all important Current Affairs quiz February 26, 2019 questions with answers updated here, at free of cost to succeed in all competitive Exams and Interviews. Who has been appointed as the next US ambassador to United Nations? US President Donald Trump nominated US Ambassador to Canada Kelly Craft as the country's next ambassador to the United Nations (UN). RBI has extended the deadline for completion of KYC norms for digital wallets by six months. The earlier deadline was _________. The deadline was supposed to end on February 28. As much as 70-80% of the user base of most e-wallet companies was yet to comply with full KYC norms. Zimbabwe country Starts Trading New Currency RTGS dollar. Who has been honoured with the ‘2018 Player of the Year’ award by the Asian Hockey Federation? Indian skipper Manpreet Singh has been honoured with the 2018 Player of the Year award by the Asian Hockey Federation. Women's team striker Lalremsiami bagged the ‘Rising Player of The Year’ prize. Afghanistan formally launched shipping goods to India, through which of the following port in Iran? Through the Chabahar port in Iran, Afghanistan formally launched exports to India. 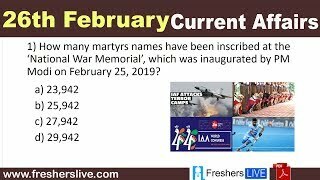 How many martyrs names have been inscribed at the ‘National War Memorial’, which was inaugurated by PM Modi on February 25, 2019? The names of 25,942 martyrs have been inscribed across 16 walls at the memorial. The memorial has been built in the memory of the martyred jawans who lost their lives protecting India during Indo-China War in 1962, Indo-Pak Wars in 1947, 1965 and 1971, Indian Peace Keeping Force Operations in Sri Lanka and the Kargil Conflict in 1999. ------- Hosts 4th Global Digital Health Partnership Summit? India hosts 4th Global digital Health Partnership summit. ONGC Rajahmundry wins environmental excellence award. Under the PM-KISAN scheme, how much amount will be given to 12 crore farmers per year in three instalments? Under the PM-KISAN scheme, Rs 6,000 will be given to 12 crore farmers with less than 2 hectares of land, per year in three instalments. Narendra Modi launched Rs 75,000 Crore PM KISAN scheme from __________________. Narendra Modi launched Rs 75,000 Crore PM KISAN scheme from Gorakhpur. Pradhan Mantri Kisan Samman Nidhi (PM-KISAN) scheme was announced in Piyush Goyal's interim budget 2019-20 and is completely funded by the central government. Which Indian state ranked first in highest alcohol consumption among kids? According to a survey conducted by AIIMS New Delhi, Punjab ranks first in the list of highest alcohol consumption among children in India. 44th Global Summit of International Advertising association was held in _______. 44th Global Summit of International Advertising association was held in Kochi. Which state became the 1st to deploy dog squad to check liquor smuggling? Bihar state became the 1st to deploy dog squad to check liquor smuggling. Shri Ravi Shankar Prasad inaugurated VIVID 2019. Are you looking for right place to enhance your Knowledge on Current Affairs of 26th February 2019 through effective Quiz section? FreshersLive grants you the advantageous Current Affairs Quiz questions with accurate answers for 26th February 2019 which covers all the important events, supreme Awards, major occurrences in the National as well as World level. All important Current Affairs Quiz questions of 26th February 2019 are updated instantly in this page. Everyday at least 25+ Current Affairs Quiz Questions are displayed in this FreshersLive page. Correct Answer for each quiz question is given at the end of the entire 26th February 2019 Current Affairs Quiz questions section. You can estimate and upgrade your GK by attending these useful quiz questions. Entire quiz questions of 26th February 2019 Current Affairs covers Competitive Exam as well as Interview point of essentially important topics like International News, National News (ie. Indian Affairs), Science & Technology News, Environmental News, Bills & Acts Passed by Government, Defence News, About important Persons, Places, Banking & Economical News, Awards & Honours, Sports News, Revolutionary Updates on Arts & Culture, Obituary, Summits & Conference, Important Committee, Schemes, Appointments, Important Days & its Theme for Current as well as upcoming Year, Books & Its Authors, Agreements & MoUs, Budget, Taxes, Various Important Lists & Indexes, Visits by World Presidents, Prime Ministers, Political affairs and all Current Events. 26th February 2019 Current Affairs Quiz Questions updated in this page are prepared in the sense to help all aspirants to succeed in various Competitive Exams like UPSC IAS and other Civil Services Examination, Various Bank exams like IBPS PO, IBPS Clerk, SBI PO, SBI Clerk, RRB PO, RRB Assistant, Insurance exams like LIC AAO, UIIC Assistant, Railway Exams, Various Central Government Exams like SSC CGL, SSC CHSL, and more. Attempt all the Current Affairs Quiz Questions of 26th February 2019 and evaluate your score by matching your response with the correct answers mentioned at the end of this quiz questions section. By practising the FreshersLive Current Affairs Quiz Questions on a daily basis, you can surely succeed in the competitive exams as well as the interviews easily. Make use of this ultimate resource to the fullest and quickly achieve your goal!